After a successful weekend working with Five Hole for Food’s hockey event on Granville in the pouring rain, my cold is worse than ever, and as result, perhaps I’m even a bit more cantankerous than usual. However, I’ll try not to let this affect my answers to your Canucks-related questions. Andrew asks: What do you think of the rookies that have been called up and put on our 4th line? Is it a good idea to keep changing them up? Is MG or AV giving them enough opportunity? Who has stood out the most for you? Katie: Holy four questions at once! Remember I’ve taken quite a few cold meds today, Andrew. I’ll try to tackle some of these. 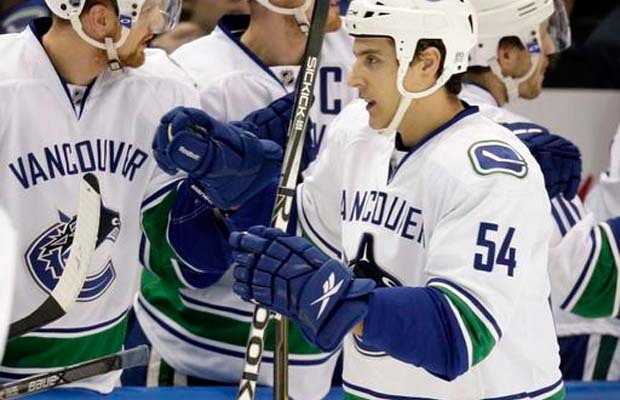 So far Guillaume Desbiens, Raffi Torres, Cody Hodgson, Aaron Volpatti, Jannik Hansen, Tanner Glass, Mason Raymond, Jeff Tambellini, Mario Bliznak, Alex Bolduc, Victor Oreskovich and Rick Rypien have all played on the Canucks’ fourth line this season. That’s quite a lot of juggling, even for AV’s standards. The part the Canucks are struggling with is finding a centre for this line, which Ben Kuzma said this morning may be filled with Zenon Konopka from the Islanders by the trade deadline. Hodgson, despite a decent showing, was sent back to the Moose last week, supposedly because he was only showcased on the roster for some NHL experience. Out of the fourth-line callups, I like Volpatti the most because he’s tough and hits hard. I also enjoyed seeing him play on the Moose before he was called up. I’d like to say CoHo but I didn’t see enough of him to get a solid opinion. Jared (@JThompsondesign) asks: Is there any news on Rypien? Would he get in the line-up right now if he was available? Katie: Still no update released on Rypien, and yes I think he would be played because the fourth line needs a centre (as mentioned above) which Vancouver hasn’t been able to fill since Rypien took his leave of absence in the first place. In my opinion the Canucks could also use his fighting skills, seeing as no one took on Getzlaf after his hit on Hamhuis. No doubt Rypien would have stepped up. Ollie asks: Hey Katie, I always enjoy your column and I’ve been meaning to ask you. What do you think Alain Vigneault’s favourite word is? Trent asks: With the Canucks leading the league and starting to look like Cup favourites, what would be the impact to the team’s fans if in fact they don’t win the Cup? Worse yet, how would the city react to the team if they were upset in the first round to say, the Flames? Similarly, are the Canucks going to be a powerhouse for years to come or is the window closing and this their chance? Katie: Another multi-part question! You guys really want to take advantage of this head cold, don’t you? A lot of long-time fans have recently admitted to me that they’re not getting their hopes up for exactly this reason: they’re used to disappointment, and don’t want to risk feeling the same emotional blow many experienced in ’94, or even in the past 10 years. The hype pelting the loyal fan base from the media seems to be blocked by an invisible force field to keep feet grounded, heads clear and hearts protected. Needless to say Vancouver would be a quiet, sullen city for a month afterward, and the bandwagon would be quite empty for a while. If Vancouver lost in the first round with THIS roster? I think there could possibly be a riot on Granville if the Canucks got ousted to rivals like the Flames or even the Backhawks that early – joking, but not impossible. But Vigneault would be fired 100 per cent. No way would the Aquilinis keep AV around if Vancouver were ejected from the playoffs in the first round. Not this year. The media would also have a ball with this, as speculation of purging would be high. Personally I’d be very upset and disappointed, but I’d still be cheering for Vancouver next October. The Canucks will be a good team for a while because they’ve locked in their best players for many years and have a pretty decent roster of call ups available in Manitoba. Gillis has done well for Vancouver and I believe he’ll continue to do so. Fiann asks: Other than your blatant open lusting for Bertuzzi, what’s YOUR most embarrassing moment specific to reporting/blogging on the Canucks. Katie: Hey, I don’t find my love for Bertuzzi embarrassing at all. I find it awesome (he scored twice on Sunday, by the way). Shockingly, I haven’t had an embarrassing moment. I’ve had more pleasant surprises than awkward ones. The worst is probably just publishing a typo and getting flamed for it because I didn’t edit before posting. Note to writers: always re-read before you submit, especially when you’re a girl writing about hockey and people assume you don’t know anything about the sport anyway. LOL. This was a long post, and I can’t believe I sat upright long enough to finish it. Enjoy your week, Canucks fans, while I enjoy more extra-strength Benylin.